One of the "joys" of living in the middle of the country (or in warmer climes to the south) are the bugs. And the fact we had such a mild winter means...you guessed it - more bugs! Some of those bugs can cause some serious health problems with your pets. Thankfully, an ounce (or less) of prevention on the back of the neck once a month saves a lot of headaches. And in some cases, heartaches. As you know, I'm talking about flea/tick/heartworm prevention products such as Advantage or Revolution. And the reason I mention heartaches is because two of those little bugs buggers can be fatal. This week, we're talking ticks. Ticks transmit a disease called Bobcat Fever that - up until this year - was almost always fatal to domestic housecats. There is no way to trace the disease, and symptoms are usually very vague - at least in early stage. Lethargy, fever. But internally, this disease is wreaking havoc, clogging arteries and causing a cascade of irreversible organ failure. In one vet's words, a terrible way to die. Summertime brings a lot of cases to the midwest and southern United States. 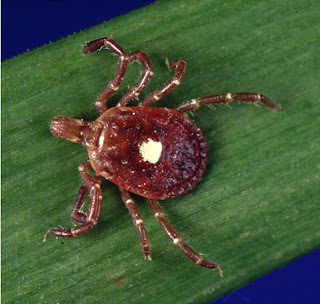 In rural areas south of Kansas City, it's not unheard of for veterinarians to see three cases or more a week during tick season. But now, for an infected housecat, there's hope. And it's home grown, too. Dr. Leah Cohn, professor of veterinary internal medicine at the University of Missouri, along with Adam Birkenheuer of North Carolina State University, have come up with a treatment to combat Bobcat Fever. We won't go into the nitty gritty, except to say that the disease is in the same family as malaria and is favorably responding to a cocktail of malaria-type drugs and antibiotics. In their study, 60% of the infected cats survived after receiving Cohn's new treatment. it's not perfect, but 6 out of 10 cats will now have a chance thanks to Drs. Cohn & Birhenheuer! Bobcat photo: ucumari. Published via Creative Commons. One vet who's been dealing with the devastation of Bobcat Fever is Ellen Ratcliff, who practices in the Springfield, MO area. She said that since she graduated vet school 11 years ago, pretty much every cat that contracted the disease died from it. Last summer, with the new medications onboard, almost all of the 25 infected cats she treated were released. Of course, one almost foolproof way to save yourself a lot of vet expense and heart-stopping worry is to keep your cats indoors. As bobcat fever is transmitted exclusively through ticks or transfusion of infected blood, an indoors-only cat is most probably safe. But as our vet is fond of saying, it only takes one bite, from one bug. Just ask Zac March, director of eLearning at MU. His cat rarely went outside, yet was bittten by a tick and infected last year. She was one of the few who did not respond to the treatment - and sadly, they lost her. 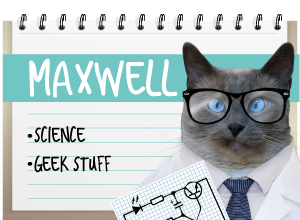 Another thing, if you're like me and you have a kitty with clever paws (yes, I'm looking at you, Maxwell!) then you may have the occasional escape artist on your hands. So we happily pay $15/month and apply flea, tick & heartworm prevention. Please read labels carefully when applying medication - drugs intended for dogs can kill cats! We are indoor only kitties, but those ticks can hitch a ride in on himans. Now that would tick me off fur sure! MOL Brian! We'd be 'ticked' off too if we got bit by one of those nasty things! I never knew about bobcat fever! It does not look like it is in my part of the country - at least not yet. But as everykitty knows, these things have a habit of spreading. Mommy's gonna be in your part of the country in a few weeks, working! We'll hafta make sure she waves hi to you, Sparkle, while she's there! I had never heard of this bobcat fever before... I don't think we have it here. But we do have lyme disease carrying ticks. We all get dabbed. Icky but necessary. we knows what you mean! *shakes head* ICKY! Great advice, you guys. Our boys are indoor only cats, but as Brian said, ticks and other critters can still make their way into the house. So we're all about prevention, too! Yes, even if it does involve icky stuff on the back of our necks! Fanks you for sharing Dash & Whskr! I'll make sure TW doesn't visit those states and bring ticks home to me. We had a human friend down south who got Rocky Mountain Spotted Fever from those ticks. oh my cat! That sounds nasty! Hope friend is OK now? That was a very informative and excellent post. I've never heard of Bobcat fever, probably because we don't live in that part of the country. We get lots of fleas, ticks, and mosquitoes, but since I'm indoors, they don't bother me. Luckily we haven't even had any fleas hitchhike into the house. I'm glad you're protected and that vets are finding some treatments options for this disease. We do too! 60% is a LOT better than 0% survival! You lives in a cool place! Our state doesn't sound very merry tho! MOL! We have indoor kitties, but I'm glad that there is some help for the poor kitties who get bitten by that awful bug! We live in a Texas. Eventho we are inside, our human can have those ick ick things hop on her. And then they chomp us. Thanks for sharing this important words with us! *shudder* we don't want any tick chomps! Those icky things can hitch rides on any human - or doggie for that matter! So glad your human is watching out for them! Ticks are scary! My papa (human papa) was bitten by a tick a few summers ago and contracted Lyme Disease. He was VERY sick, but fortunately with lots of antibiotics he recovered fully. Oh Pip! We're so sorry your papa had to experience that! Mowzers, we're so glad he's better!! Ewww! We has ticks here but mostly it is the mosquitoes and heart worm. We gets special medicine for ticks and mosquitoes. Thanks for letting us know (particularly about Bobcat fever. Me wants to thanks yous for your Purrs. Me is felling better. Nellie! 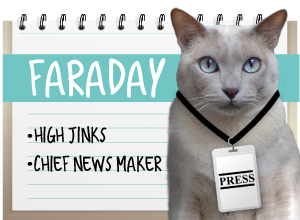 That's pawesome news! So now you can put Kosmo back in his place, right? Oh my--that is a skeery disease! We are glad to read there is now a better treatment, but you are right that an ounce of prevention.... I don't live where there are ticks....but there are waaaaaaaay too many cars and buses and stuff, so I do not get to go outside. I have a good view though! XOXOXO Stay safe! Spitty, cars & buses prolly can kill just as dead as bobcat fever, so it a very god thing you Rule indoors! Good info! A friend of mine had tick disease and almost didn't make it! MOWZERS, Rumpy! That's skeeery! We're so glad your friend made it! We don´t have any Bob cats in Sweden so we don´t have Bobcat fever. But we do have other tick disease´s. Since I´m mostly inside I have never had a tick stucked on me , mom have just found one crawling around on me that she cought and killed. FaRADaY: Mowzers, that was a close call! 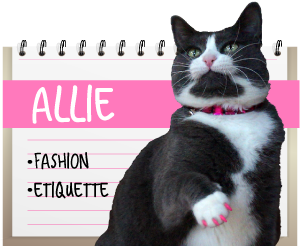 Mommy doesn't let me & Maxwell out, but Allie gets to go out with her Security Detail (momma or papa). They gonna be extra careful. Even though we're all on the tick prevention stuff, she not taking chances!